... and my son, Mike joined the business in 2015. Our farm in Buckinghamshire is surrounded by acres of rolling fields, yet I've always preferred to keep our turkey flock small enough to allow me to keep an eye on every bird. Maybe that helps to explain why our welfare standards have been described as 'exemplary'. We firmly believe in traditional methods. In June each year, our white and bronze turkeys arrive as day-old chicks. They are carefully reared over the following months, until Christmas when they are fully mature. All processing is carried out on site. 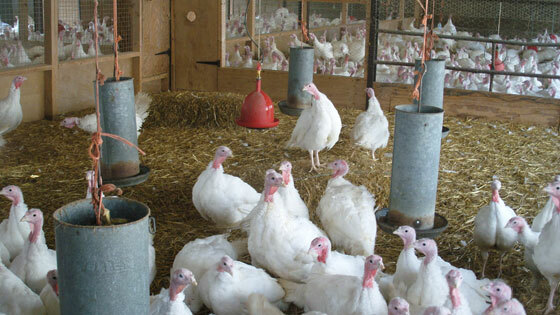 Our turkeys are dry-plucked and hand finished and then, for that extra succulent flavour, they are hung for 10-14 days. Finally, our turkeys are boxed, complete with pop-up timer and recipe leaflet, ready for your collection. As well as welcoming new customers, a big thank you to all our regular customers, who come back, year after year and for your many messages of appreciation. We wish you a very Merry Christmas!